democracy, the rule of law, individual liberty, and mutual respect and tolerance of those with different faiths and beliefs." "Liverpool is a city which has a beautiful multicultural mix, which makes it a very special city!" This is a quote from a Year 5 pupil at our school. British Values are an integral part of our school ethos and curriculum and is present across all three schools and within our environment. British Values are taught along side our R.E. and Learning Challenge Curriculum. 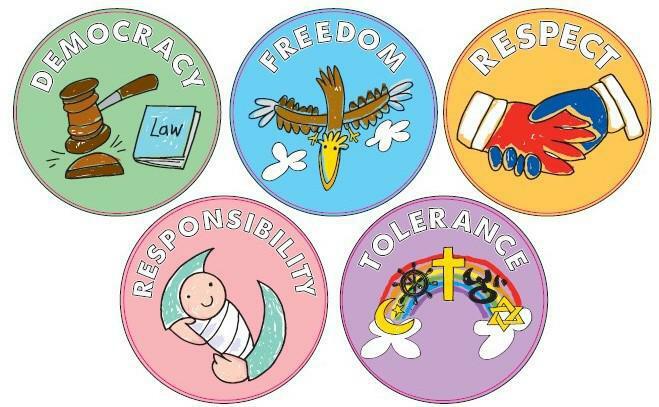 We created our own 'Anfield Values Trail' using symbols designed by our pupils to highlight areas of our school environment that are connected to one of the five chosen areas - Democracy, Freedom, Tolerance, Respect and Responsibility.